Governor Kim Reynolds has appointed a former Iowa Republican Party chairman as the Iowa Lottery’s new chief executive. 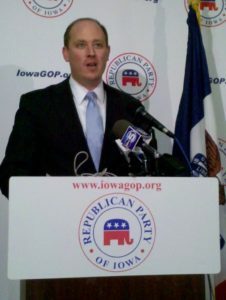 Matt Strawn of Ankeny worked in Washington, D.C. as a congressional aide before serving as the Iowa GOP’s chairman for the 2012 Iowa Caucuses. His first day as Lottery CEO is next Monday. Previous Iowa Lottery president and CEO Terry Rich retired on December 31, 2018. Reynolds announced eight other appointments to key administrative posts in state government today. Debi Durham has been the Iowa Economic Development Authority’s director for the past eight years and she’ll do double duty as director of the Iowa Finance Authority. Reynolds fired the previous Finance Authority director last March after employees complained Dave Jamison was sexually harassing them. Carolann Jensen had been serving as the agency’s interim director. Reynolds has named the interim or acting directors of the Iowa Department of Cultural Affairs, the Governor’s Office of Drug Control Policy and the Iowa Department of Homeland Security as her choices for those roles on a permanent basis. Any person appointed by the governor to lead a state government agency must win confirmation to the job by a two-thirds vote in the Iowa Senate. Read the governor’s full announcement on administrative appointments below. (DES MOINES) – Iowa Governor Kim Reynolds announced several cabinet appointments today. These cabinet secretaries will serve as important agents as Governor Reynolds carries out her work to serve Iowans. Stephan Bayens has been appointed to lead the Department of Public Safety, effective January 14, 2019. He previously served as an Assistant United States Attorney and as a Assistant County Attorney for the Polk County Attorney’s Office. He also previously served as a clerk on the Iowa Court of Appeals and worked at the Iowa Attorney General’s office. Stephan received his law degree from Drake University in 1999. Dan Craig has been selected to serve as interim director of the Department of Corrections effective January 7, 2019 while a nationwide search begins for a permanent director. Dan brings 34 years of experience in the correctional system which includes serving as the deputy director for the Department of Corrections. Mr. Craig has an Associate of Applied Arts Degree, from Hawkeye Community College and has a Bachelor of Science Degree in Public Administration, from Upper Iowa University. Debi Durham will remain as head of Iowa Economic Development Authority (IEDA) and also serve as director at the Iowa Finance Authority (IFA), effective January 7, 2019. She has been IEDA Director since January 2011. For 15 years, Debi served as President and CEO for the Siouxland Chamber of Commerce. Her extensive experience in state government and on economic issues will make her an asset to both departments. Joyce Flinn has been named Director of Homeland Security and Emergency Management, effective January 7, 2019. Joyce was named acting director of the department in June 2018 and has been serving in various emergency management roles since 1997. Joyce has been chief of operations during numerous disaster responses, the two most significant being the Missouri River flooding on May 25, 2011, and also during an EF-5 tornado and subsequent flooding that devastated the state in May 25, 2008. Joyce has a degree in criminal justice from Simpson College. Jeff Franklin has been selected for the role of interim director of the Office of the Chief Information Officer, effective January 3, 2019. He previously served as the Deputy Chief Information Officer and also worked at the Department of Administrative Services. He has also held the position as an Information Security Officer and Administrator for the Department of Natural Resources. Jeff received his Masters Degree in Management Information Services from Iowa State University in 2006. Adam Humes has been appointed to lead the Department of Revenue, effective January 3, 2019. Adam currently serves as the deputy director for the Department of Revenue and prior to that he served as an Assistant Attorney General to the Iowa Attorney General. Adam has an extensive background in state government and as a litigator. Adam graduated from the University of Iowa College of Law in 2007 after graduating from the University of Northern Iowa in 2003. Chris Kramer has been named Director of the Iowa Department of Cultural Affairs, effective January 7, 2019. She was named acting director of the department in August of 2017 and previously served as the deputy director. Prior to being with the state, Kramer was VIce President of the Science Center of Iowa for 12 years. As a member of the project team responsible for creating the new learning center which opened in 2005, Kramer managed the $62 million capital campaign, the single largest museum capital campaign ever undertaken in Iowa. Matt Strawn has been appointed to lead the Iowa Lottery, effective January 14, 2019. He is the co-founder of Next Generation Public Affairs and has an extensive background in public relations. As an entrepreneur, Matt helped bring an Arena Football League (AFL) professional franchise, the Iowa Barnstormers, to downtown Des Moines. He is a 2003 graduate of the Catholic University of America, Columbus School of Law and graduated from the University of Iowa in 1996. Dale Woolery has been named Director of Drug Control Policy, effective January 7, 2019. He previously served as an associate director for the department and has 24 years of experience in this agency. Prior to that, he worked as the station manager for KRNT radio. Dale graduated from the University of Missouri- Columbia in 1977.